I am pleased for your visit and hope you will enjoy what you see and read here. First a few words about myself. I am a studio potter and have been so at least in spirit since the spring of 1970 when Bud Wilkinson, the Potter of Dayspring, set my imagination on fire for work with clay. Bud’s picture and the story of our encounter in the form of a fable are included here. Since this first encounter with clay I have been drawn deeply into the work because of it’s creative energy and the tactile response of such supple material. Pottery as metaphor has also been a rich gate of spiritual inquiry for me. Shortly after meeting Bud Wilkinson, I had a crash course in pottery with Richard Lafean, studied with Nancy Joy at the Corcoran School in Washington D.C. and took a year of courses at the School of the Chicago Art Institute. After moving to Columbia, Maryland in 1972, I worked as a part-time studio potter and made clay throwing bodies for local potters. Since then I have continued to study at workshops with some amazing artists: Jim Kempes at Ghost Ranch in New Mexico, Wayne Higby and Stewart Kastenbaum at Haystack Mountain School of Crafts in Maine, Jim Romberg and Biz Littell at Laloba Ranch in Colorado and lately with Steven Hill. 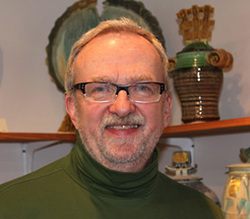 My life as a potter has evolved on a part-time basis alongside my primary work for 38 years as an Episcopal priest. In 2005, after 28 years in parish ministry at St. Paul’s Church in Newburyport, Massachusetts, I retired from parish ministry to spend my time working with clay and making beautiful things. My clay work now moves in two directions: raku and oxidation porcelain. Shown here are a few raku pieces, with images of my porcelain work eventually being available as well. As my clay work evolves and new work appears in these pages, I hope you will return from time to time to see what is new, put your name on my mailing list for announcement of future shows and stay in touch by contacting me if you are looking for gifts. In addition to clay, “the soul’s journey into God” has also been central to my life journey. In the past I have enjoyed leading retreats each year with Nance McGee on “the Path of the Mystic” at Shalom Mountain Retreat Center in Livingston Manor, New York, where journeyers explore the spiritual life in creative and deep ways. These retreats and many others are open to all, so I invite you to have a look at the Shalom Mountain offerings. Please contact me to let me know if anything you see or read here is stimulating. Clay and the spiritual life are all part of the Great Conversation so dive in!